Zebra’s feature rich, competitively priced GC420 desktop printers bring Zebra quality, durability and reliable performance to many low to medium volume, direct thermal and thermal transfer printing applications. The Zebra GC420d direct thermal desktop label printer offers a high impact double walled polymer casing. 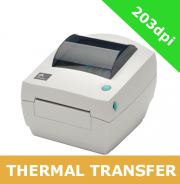 The Zebra GC420t thermal transfer desktop label printer offers the flexibility of printing in either direct thermal or thermal transfer mode. It is available in 203dpi resolution, comes with serial, parallel and USB interfaces as standard. The Zebra GC420d and Zebra GC420t desktop printer has a maximum print width of 104mm.